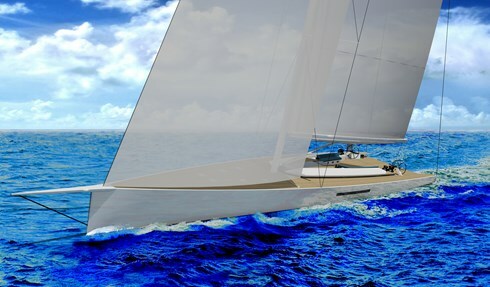 In September 2010 during Voiles St Tropez the Wally organisation engaged in a consultation process with owners, project managers and designers, including Owen Clarke Design, with the goal of producing a new racer cruiser class box rule. The new class is called the Wally Cento and the rule is intended to define a maxi racer-cruiser that conforms to minimum standards of interior and fit out as outlined in the 2011 Wally rule itself. For the owner who wishes to race at the top level the rule dictates that the interior fit out while retaining a high level of quality and style must be tempered with some restraint. In order to achieve the minimum racing displacement of 45 tonnes the yacht will require the simplest interior allowed by the rule. This comprises of a minimum of three en-suite cabins for the owner and guests and a lower specification in terms of systems than might otherwise be expected in a yacht of this size. For the owner who is less concerned with hitting the minimum displacement target a quite different interior can be imagined than the one illustrated below. The relatively wide beam provides for a spacious saloon and cabins, but the entire volume of the interior is not untilised. It is intended that quite substantial areas of the yacht remain a clear coated carbon finish saving weight and keeping that weight out of the ends. The rule specifies that no more than 10% of the accomodation area is to be a painted finish and so the intention is to offer clients a range of 'light weight' options and styles that compliments the modern look of the yacht. Owners en-suite cabin with queen size double. Two guest cabins with split beds that give the option of singles or doubles. Additional pullman berths in each of these cabins would be an option if racing offshore. A large saloon split into a separate lounge and dining area. Galley to port with rule minimum, 3 hob stove, oven, fridge and freezer. Chart table with day head to starboard. The crew area is spacious, but it can be fitted out using lighter materials and methodology than the guest areas and it comprises part of the accommodation requirements of the rule. There is one en-suite cabin with two bunks and an allowance for pipe cots if additional crew is required for cruising or if racing offshore. On deck the available space is impressive with plenty of opportunity to separate guest areas from the working positions in the cockpit. The requirement to save weight means that there is a large volume available under the deck aft of the helm stations for a tender and other cruising paraphanalia such as a dive compressor, all of which can be unloaded for racing. While the Cento is clearly aimed at the owner who takes regattas seriously, even an interior fit out to the minimum requirement of the Wally rule makes the boat very comfortable to cruise. Noise levels outside the machinery spaces are required to be no greater than 65db with the genset running, head height in all living areas is >1.90m and the motoring speed has to be greater than 10kts. Any owner can expect to cruise at their leisure in great style or get to where they want to be very quickly; turning heads on arrival in what is a stunning and unique yacht, even by Wally superyacht standards.